One complaint many people have had (particularly with Asus tablets) is that the performance of the embedded storage is just plain bad. So I ran some storage benchmarks (2 apps, 13 metrics) on 11 different devices and compiled the results. In sum: while adequate, most devices aren't exactly speedy in the storage speed department. 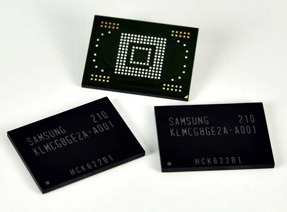 That's likely all set to change soon, as Samsung (who, let's not forget, is one of the world's biggest suppliers of everything electronic) has begun production of a new generation of embedded storage. The company claims read speeds of up to 140 MB/s and write speeds of up to 50 MB/s (for comparison, the fastest microSD card on the market checks in at 17 MB/s and 19 MB/s, respectively). IOPS performance is said to come in at up to 3500 (read) and 1500 (write) IOPS, compared to an average of about 1600/70 in our benchmarks. In sum: the company claims the new chips are four times faster than the last generation. 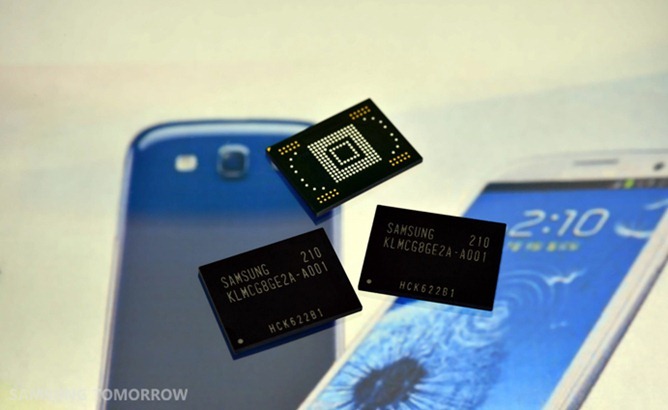 The chips check in at 16, 32, and 64GB, and even the 64GB is just 1.2mm thick. For more details (mainly PR-speak), hit up the source link below.